When did you last have a computer tuneup? Maintaining your Windows based computer is essential to keeping you safe and sane. If you have a tuneup performed on a regular basis, chances are you will be much happier with your desktop or laptop’s performance. Tuning up your PC usually makes it quicker and more responsive, helps it run efficiently, and in some respects, extends the life of the machine. You’ll be less likely to need to replace your computer if it continues to run well. As with any other complex machinery, if you don’t perform basic upkeep on your computer, you’ll notice over time that it isn’t performing as well as it did before. In many ways, tuning up a PC keeps it internally organized. Essential files are managed appropriately, junk gets tossed, and parts of the system that were starting to get messy or torn apart are patched back together again. How often you tune up your computer is largely a matter of preference. Some people do it semi-annually or annually, while others take a more random approach. In most cases, you should probably tune up at least once every 12 months, but every six months is probably better. 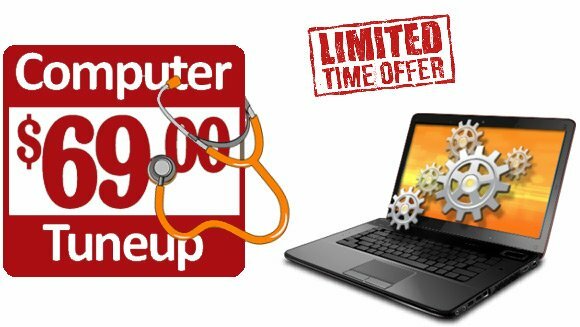 For a limited time (expires November 30, 2018) get a complete computer tuneup for the special rate of just $69.00…normally $99.00 (in our office only). This full service computer tuneup will help your computer perform better, and help to secure your personal information. Standard adware, spyware, malware, and virus removal included. Extensive removal may require additional cost. Disclaimer: Please note that we are not responsible for data loss due to and including, but not limited to viruses, malware, spyware, hardware failure, data corruption, etc.